This was written after a spectacular Funk Brother’s performance on a hot, end-of-summer night in Detroit in 03‘. After this concert, pianist Joe Hunter died, and there was a serious falling out of the movie’s producer and members of the group – no surprise – and the group does not perform with all of the same, original members who appeared that September night. This made this concert even more magical, for the group will never play together like this again. The Funk Brothers headlined tonight at the Detroit Festival of the Arts, on a stage nestled between the Detroit Science Center, Detroit Institute of Arts, and the Museum of African American History. A triangulum befitting the Funk Brother’s genius, artistry and Black Detroit roots. They’d come a long way since playing the clubs and joints of Black Bottom, or even, from their more recent years of relative obscurity. The concert was a celebration of their stupendous gifts, and, as we knew out, our good fortune of being fortunate enough to have grown up with their music in our own aural and literal backyard. There were thousands waiting for show-time in the balmy night, and standing ovations before a note was even played. The band seemed moved to tears at such an ecstatic reception. We raise our heads to the sky in wonder – rain had been predicted all week, but no rain ever came. It seems that even the skies would honor these men and bless us all on this clear and special night. The crowd is more than electric, it is a part of the performance itself, undulating with outbursts of adulation. Jack Ashford, venerable, dignified, respectful and respected, looking like a science teacher or a old time preacher, his tambourine blinging in the lights, ringing like church, sizzling like a rattlesnake in the night. Bob Babbitt, the bass-man got much applause and we were glad to honor him so; how cool must this white man be to have played and lived around these extraordinary Black men, to have had to come behind the great James Jamerson. Eddie Willis, Mississippi prince on a throne, sitting down front, the guitar his sceptre; talking like down-home. Uriel Jones, Ivory Hunter, Messina, all of them on the stage; they create an amazing monument of sound – a massive, complex, joyful noise. They are actually symphonic, a heavenly, orchestral blast of pride and joy. They are getting old, there is no denying this, and one can feel the crowds silent, collective prayer, that these men be allowed to savor their new good favor and fortune for as long as they can. The band is so tight, so familiar, so………..Motown; they sound surreal, as if actual humans can’t possibly be playing. This music has been in our heads and hearts and histories for so long, the idea that there are actual people playing like this is almost unbelievable. We know every single word and note of every single song. There are moments that can only be described as transcendent – dreadlocked women do the STOP! In The Name of Love; we cast aside our 70’s and 80’s poli-sci judgments of crossovers and compromises to return to our original, pure and giddy loving of this sound. With now wide hips and swelling ankles, we danced the Shingaling, the Shotgun, the Four Corners, like we did when we were fast, fine and young. White guys with beards and bellies sang My Girl into invisible mikes, and a few young dudes from the hood did the Temptation Walk with old suburban guys. The audience breaks out in loud, spontaneous applause when they hear the lyric “War is not the answer..” from Marvin Gaye’s song from more than one generation ago, a song that must now be sung again for a brand new war. A solid row of folks, blacks and whites, do the Temptation walk, like The Wave at a football game – an amazing sight in this most segregated of metropolitan areas, a reminder of a brief time when, many years ago, we danced to one great sound. I’m there with my brother, a rare excursion for he likes quiet life; dislikes crowds. We dance and holler like the kids we once were, screaming about our days at the Motown Review, and remembering how we know the first note and beat on every Motown record, a necessary requirement for working in our Daddy’s record store. We know that we are experiencing something special, and we are grateful to share it with our mother frail but excited sitting next to us, remembering the days when she finger popped to the 45’s in our living room. She, old and fragile now, and she and her sister saw the Funk Brothers at the Twenty Grand club in their young fine days. She remembers the days when Jamerson, Joe Hunter and others of the Brothers found their way around the corner from the Motown Hitsville house to my father’s 12th street shop, where they’d have a “taste” or two between gigs. Our father is long gone, and this summer my mother’s sister joined her husband, in that concert in the sky. We all speak of her and miss her, and all of our youth gone by. During the band’s tender tribute to it’s members now gone, we wipe our eyes at the thought of those we loved, maybe listening to Funk Brothers above, making celestial noises to the Lord. It was one of those nights that years from now, people will say that they were there – even people who weren’t. It occurs to me that on this night, something happened. When Motown left Detroit a part of our collective heart stopped; I could feel on this sweet Saturday night that the triumphant victory of the Funk Brothers was a sign, another cornerstone in a rebuilding of Detroit had just been set in place; a soul had been breathed back into its rebirth. I was glad I was there to honor these men, and yes, to pay respect to the one who finally told their story. It was a hallowed night, a spirit filled night, I realized that this music was always something like a religious music to me and to many others. 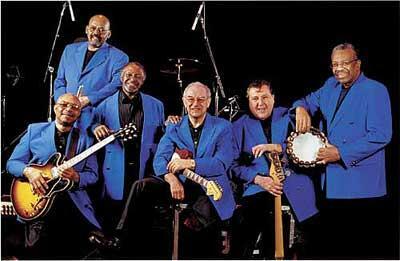 I was blessed to have seen the Funk Brothers on that beautiful Saturday night. It was one of those times when I remember why Detroit was the center of the modern musical universe. Categories: Musin' on Music | Tags: Black Bottom, Bob Babbitt, Funk Brothers, Jack Ashford, joe von battle, Motown, Temptations, Twenty Grand Club, Uriel Jones | Permalink. Thank you so much for sharing so much valuable, and memorable information, and stories about these incredible musicians, and people. As a drummer of over fifty two years, and now approaching age 70, I’m still amazed when I hear the great grooves played by the MoTown musicians. What an inspiration! John, I thank you so much for your support. It’s good to see that musicians are reading these stories. I enjoyed this artical. I grew up with Motown music and I love seeing articles like this. More of same is needed.